These lovely 2 ladies had their head ready for quite some time. This weekend I finished them finally. 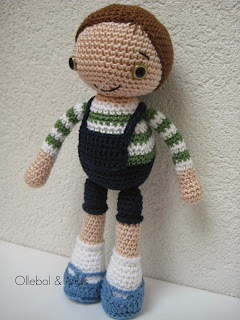 They have a little crochet wig with tails. Filled softly so a little hand can catch them easily. I made the creme one a little scarf from the knitting pattern of Maizy Moo. Ollebol & Muis 5 years! I have been very busy lately and did not find the time to write something on my blog. 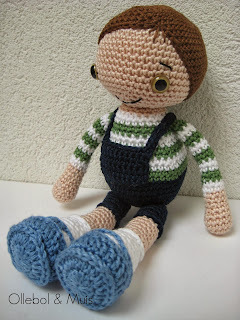 I made some dolls and other custom orders but I will show you these later. 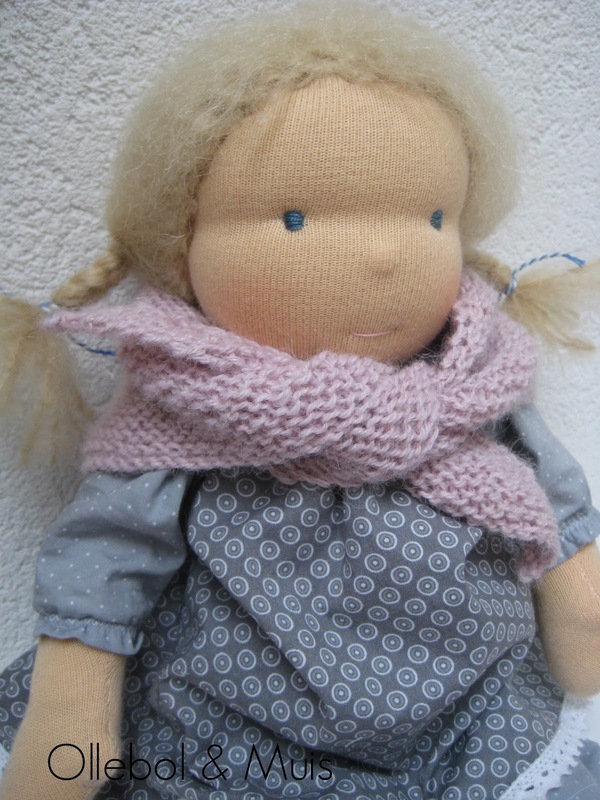 Ollebol & Muis is celebrating it's 5th birthday this month. I wanted to share this with my customers but what can you do when you sell different things? The handmade things are too much work to just give away to everybody who buys something in my store so I have a nice present for all who order some Sonny Angels. Buy 4 and you get your 5 "blind" for free! The celebration will go on till the end of this month (januari). This doll was on my table for a few weeks. Her body was ready but I couldn't find the time to finish her and put her together. 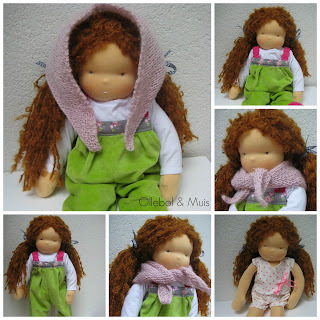 But when you have finished your doll the next big step is to make clothes that will fit and look great on your doll. I chose some nice quilt cotton and made her a dress with matching trousers. 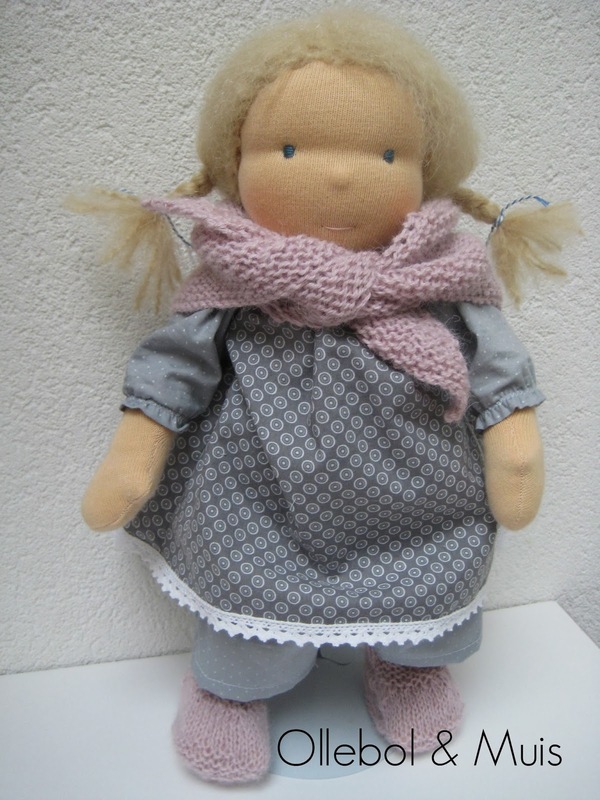 One thing I really would like to do was to go to a doll course of Fabrique Romantique in Amsterdam and finally a few weeks ago I made this doll. With a few other doll makers (some of them made their first doll) you could choose between a 32 cm or 40 cm doll. I made the big one and had a great day. I met some very nice people (two of them who follow my blog, Wendy of Lief Monster and Sandra of Blauw ruitje) and Anouk of course in her great shop. 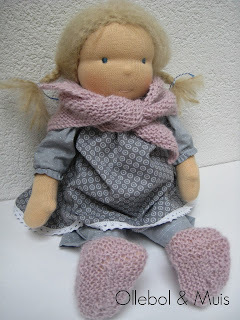 As always, her clothes took more time than making the doll but that is because I am very precise and not satisfied easy. The Design Market in Brussels is coming nearby and I had some items on my wishlist / to do list. This is my latest crochet item I made. 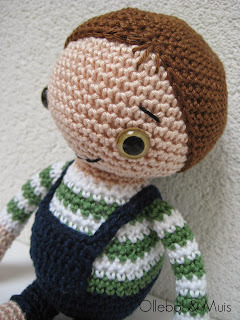 He is a little friend of the girls I crochet before. This one is joining his lady friend in my shop and if he doesn't find a new home sooner he will come with me to Brussels. Almost the eind of Oktober.. Haloween is coming. In Holland it is not such big thing but you can buy all kind of Haloween things in the shops. I did not buy anything because when you do I think you have to think big and make your whole living room in Haloween style. When I saw this little item in the last Mollie Makes I was sold. This was something I liked and wanted to make. With masking tape secured on the wall it looks nice, not too much but a small hint that it is the end of Oktober. One's in a while you see some nice mushrooms during this time of the season. I had 7 mushrooms near my tree before my house but someone did not appreciate them and kicked them all. Yesterday I discovered this nice one near our house.